Having (quite a while ago) completed my plastic Orc Bloodbowl team from the Bloodbowl box, I have since let my human team sit gathering dust. Well it's time to change that. However, the models provided in the box make for a silly line-up. To get a working team, I need to make some changes. The first (and maybe only--I haven't really decided) step is to turn a couple of the many linemen into a more useful position--blitzers. I went on to cut the leg on the left into three pieces at the knee and ankle. After a bunch of pinning and careful, strenuous drilling, I was ready to roll! ...Until the newly glued foot fell off and skittered into oblivion. Then I was ready to cry. So, after much tossing aside of possessions in the ensuing search, I carefully set the first model aside and decided on a more conservative conversion for the second blitzer. A simple arm re-positioning and a sculpted knuckle duster. Fortunately for me, by the time I got to the sculpting stage on the second model, the missing foot dropped back from oblivion into plain sight where it patiently awaited me. NOW I was ready to roll. There was, of course, much gap filling, but the really important putty work needed to sell these guys as blitzers. I needed more than just the pose. Looking at the original models, I noticed the distinctive leg padding. So I slapped some on. An easy step. I also gave them some plumes by sticking a tiny length of paper clip into the tops of their helmets to use as support for the sculpting. Finally, I slapped on some fun, ridiculous, custom visors. My favorite. And that's that. Ready for basing, priming, and paint. I still need to decide whether I want to try and convert some of the team into more catchers, since the box only comes with two. However, the box also comes with two throwers, which I think might be one too many. Now what would be really cool is if I could figure out a way to convert the extra thrower convincingly into a catcher... we'll see. Oh, and I have to decide if I want to sculpt an ogre. I also need to come up with some fluff for this team, for as we know, teams with a story always play better. So far I'm thinking they might be the sporting initiates of some violence-loving brotherhood of monks. We'll see what I can come up with. On another note, I've begun stripping my second-hand citadels from my last post, as well as some plastic dwarf warriors which I really messed up on my first try. I'm trying a solution of dish soap and water to see how well it works. Stay tuned to see the results. Oh, and if you have anything to say, too bad. It's not like you can comment or anything. For anyhting excluding plastic or resin, go for acetone, it's the nastiest, quickest and easist you can find. Very good work on your blitzers ! the pose is really good and the extra armour makes them look a lot nastier. Haha, I'll forgive you this one time! Seriously though, it's great to finally have someone giving feedback. You're right about the dish soap. 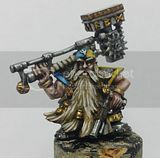 It worked great on the plastic dwarves, but not at all on the metal. Since the previous paint-jobs were thin, I just decided to go over the top on those. The next product I want to try for stripping is called Simple Green. It's supposedly natural and more or less non-toxic, but works quite well, from what I've read. Another one people talk about is Pine-sol.